All the C# code examples presented on this page can be found in the related demo function of MS Visual Studio project FinaquantProtosStarter which can be downloaded at the product page of the free .NET library finaquant® protos. As explained in the related article, subtable transformation is a simple way of applying the same table function on every subtable of an input table. Function Router1 extends this concept further; with the table functions of the .net library finaquant® protos like FunctionRouterA() it is possible to apply selected table functions on selected subtables of an input table, as the examples below will illustrate. The entity attributes (all the text and numeric attributes of an input table excluding subtable fields) determine which table function is to be applied on which subtable (sub-data of an entity). You want to calculate expected population of some cities in ten years from now depending on historical data like birth rate, population, migration rate and so on. You have an input table containing historical data for many cities, and depending on some attributes of the cities (entity attributes) like size (small, medium, big), altitude (low, high), average income category etc., you need to apply different formulas (table functions) for different cities to obtain the estimated population for each city in a result table. Scenario analysis: For the same scenario above, you may want to calculate the expected population for each city under different discrete scenarios like optimistic, realistic and pessimistic, and you may need to apply totally different formulas (or functions), each with its own set of additional parameters, to compute the expected populations for each scenario (see 2. example below). You want to calculate a performance measure for some financial assets, and for each asset group (entity attribute) you need to apply a group-specific performance function (table function). You have an input table containing data for multiple assets belonging to several asset groups, and you want to obtain the performance measure for each asset in a result table. For the same scenario above, you might have written your performance functions with another library for matrix computations like ILNumerics, R or matlab. 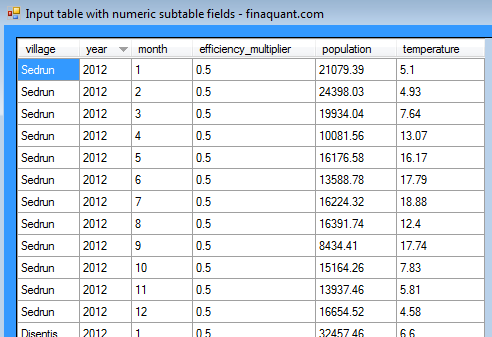 You want to calculate the performance of each asset by feeding its subtable to its group-specific matrix function, provided that all the subtable fields are numbers; that is, either numeric attributes or key figures in the finaquant data structure (see 4. example below). You have some numbers like estimations, prices, costs etc. related with some entities like city, product, or invoice in a table. You want to check and validate these numbers, and generate warnings if something is wrong. For each entity-group you may need to apply a different set of validation functions (table or matrix functions). In that sense, a function router can also work like a rules engine! With the parameters of a function router you can set dynamically which validation functions are to be applied on which entities (see 5. example below). Corresponding entity attribute combination of the input subtable which was directed to a certain table function to generate the output subtable. The entry (row) of the associated table corresponding to the particular table function applied on the input subtable. The associated table as parameter to a function router can be left empty if you don’t want to add extra fields to the result table. Table functions: For each city category you need to apply different table functions on the subtables: TF_small() and TF_large(), where TF_large() is also applied for medium-sized cities. In order to have the highest transparency about the applied estimation methods, you may want to add an additional field into your result table: estimation_method with possible values small city or large city. You can add this field into the result table by using the parameter associated table. // Function router with condition table as filtering method. // that match i'th row of condition table to corresponding table function. BaseTbl: Input table with entity attributes and subtable fields. SubTableFields: Subtable fields of BaseTbl. Each subtable with these fields are directed to a certain table function to generate output subtables. CondTbl: Condition table for filtering BaseTbl in order to determine which subtables are fed to which table function. Only the entity attributes of BaseTbl are relevant for filtering. First row of the condition table is associated with the first table function, second row with the second table function, and so on. All the subtables of entity attribute combinations that match to the i’th row of condition table are directed to i’th table function. MyTableFuncList: Array of table functions (as delegate function), each corresponding to a row of condition table. JokerMatchesAllvalues: If true, joker (match-all) values match all field values; for conditional filtering. TextJoker: Match-all value for text attributes; relevant only if JokerMatchesAllvalues is true. NumJoker: Match-all value for numeric attributes; relevant only if JokerMatchesAllvalues is true. FirstMatchOnly: If true, a row of BaseTable can be matched with only a single row of condition table with from-top-to-down as priority order. Setting FirstMatchOnly to false is useful for cases like scenario analysis. OtherParametersList: Set of parameters of any type for each table function. This parameter can also be left empty which means there is no additional parameter for any table function. If there is only one set of parameters in the array, this parameter set is shared by all table functions. Computing expected average energy consumption for household heating next year in May, in several cities based on historical data like population and temperature. 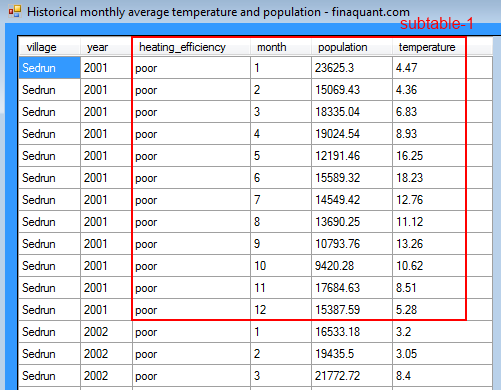 Following test table with historical monthly average temperatures and population will be used for all the examples below as the primary input. In this example, the same user-defined function is applied on every subtable, just like a subtable transformer. That is, the same function is applied for every village-year pair as entity attributes. 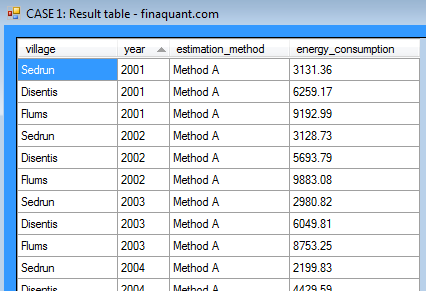 As we are interested in yearly energy consumption estimates, per month estimations are summed up in the user-defined function to obtain the yearly estimate. // assumes parameters are entered correctly. 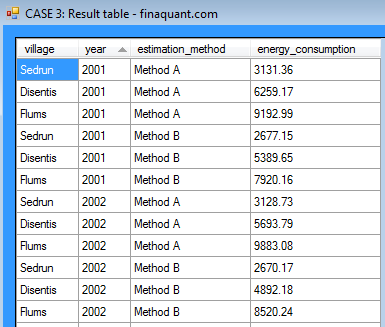 // Return table with single key figure "energy_consumption"
Now apply the user-defined table function above on all subtables of the primary input table. Note that all the example C# code presented here including the user-defined functions (and more) can be found in the Visual Studio project FinaquantProtosStarter (in releases 1.02 and higher). As you may see in the cross-section of the result table above, the same estimation function A is applied on all village-year pairs. In this example, there are two estimation methods, A and B. Accordingly, there are two slightly different user-defined table functions to be applied on different subtables. 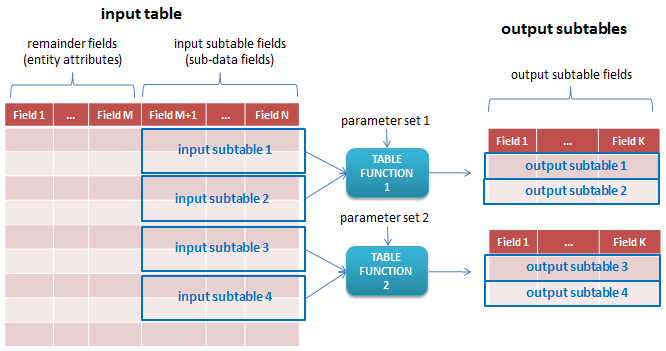 Two parameters of the function router determine, which method is applied on which subtables: Condition table (CondTbl) and function array (MyTableFuncList). As you may see in the result table above, the old estimation method B was applied all other villages until 2002; only for Sedrun until 2004. In this example, the user wants to see the estimation results for both methods A and B, for all village-year pairs (entity attributes) by setting the critical parameter FirstMatchOnly to false. FirstMatchOnly = false means, a subtable of input table can be matched with multiple rows of a condition table. This example also illustrates, how a function router can be used for scenario analysis. You ask a “what happens if” question, and want to see the outcomes for all possible discrete cases. Each case may require a different logic, and a different function with its own set of additional parameters to compute the expected outcomes. As seen in the result table above, both estimation methods A and B are applied on all subtables of village-year pairs. 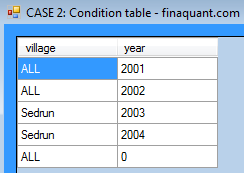 As explained in a related article, condition table is only one of the filtering methods available in finaquant libraries. There are two other filtering methods, namely condition cell array and condition matrix table. Using user-defined matrix functions as table transformer, provided that all subtable fields are numbers; that is, either numeric attributes or key figures. Note that the user-defined matrix function can be used as just an envelope for a function written with the methods of another library. This construct makes the integration of a function router with the matrix functions of other libraries possible and feasible. Look for our upcoming articles at finaquant.com about this integration issue. 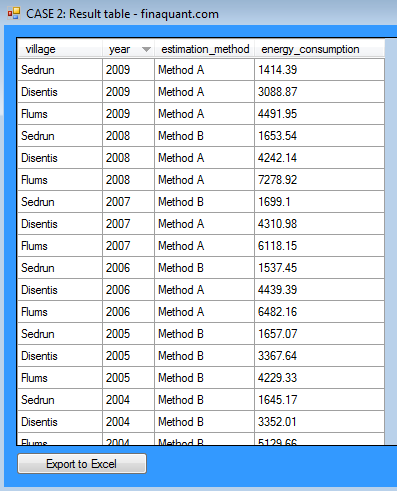 As seen in the result table above, the estimation method B is applied for the village Sedrun until 2008, whereas this method is applied for all other villages until 2005. In this example, the data (i.e. subtables) in the primary input table are not used to compute estimated energy consumptions; they are just used to calculate the lower and upper limits for estimations. The estimations come from an external source, and the function router is used to validate these numbers by checking the lower and/or higher limit conditions. The condition table (CondTbl) and the function array (MyTableFuncList) parameters of the function router determine, which validation functions are to be applied on which subtable for each village-year pair. In this way, one can dynamically define (or configure) the assignment of validation functions for each entity combination. Note that you could have as many validation functions as you wish; not just two as demonstrated in this example. As seen in the result table above, both validation methods (Lower and Higher Limits) are applied on the village Sedrun, as it was configures by the condition table. This entry was posted in Calculation engine and tagged calculation engine, table functions, table transformation. Bookmark the permalink. Function router can be a very useful function for those who spend hours and hours for converting some parts of tables into matrices on a case-by-case basis like myself. I often use R for matrix computations and I would like to see an example how function router can be integrated with R, as you mention in the article.